Q2ID - Converts QuarkXPress files into Adobe InDesign CS5 to CC 2017! 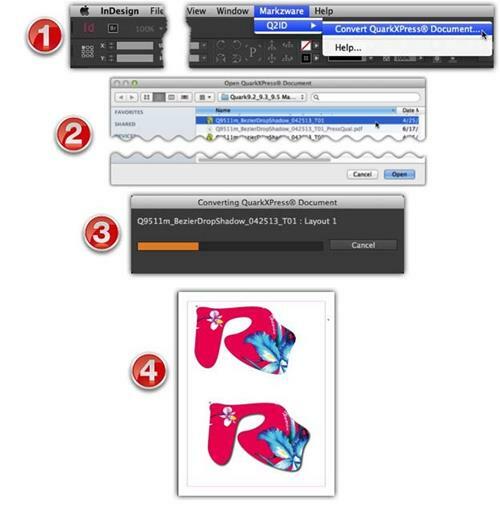 Use Q2ID (an InDesign Plugin) Converts QuarkXPress files to Adobe InDesign, Fast & Easily. Let's take a tour how Q2ID works. Click the “Markzware” item on the InDesign Menu Bar then select “Convert QuarkXPress® Document…” from the Q2ID fly-out menu. You will see a conversion progress bar. The QuarkXPress file will appear rebuilt in InDesign. Save this new InDesign file. **You do not need to have QuarkXPress loaded on your computer in order to use Q2ID. Q2ID requires InDesign only. Q2ID (QuarkXPress to Adobe InDesign) is a useful Adobe Plug-in of InDesign, which could converts QuarkXPress contents into a new Adobe InDesign document, with a single click, everything you wanted will be done within a few seconds! At the same time, you can re-create all Quark detailed contents while using InDesign. Q2ID will show these details by its own unique way, but still keeping former contents, web pages, Gradation & Representation). For instance, if you are rearranging books with Multilanguage by using Quark, the complicated content will take you a lot of time and energy! However, Q2ID could make your job much more easily & faster based on its professional converting technology. The contents which could be converted from Quark are as follows: page positioning, color models, fonts and styles, images, and text attributes as well as tables, layers, blends, runarounds, linked text boxes & anchored boxes, pantone colors and other color models. Over the years, I have found the Markzware Conversion Tools to be some of the best written and easy to use products on the market. The latest version of Q2ID (QuarkXpress to InDesign) is the one major tool that Adobe "should have" written into InDesign. The ability to directly import my customers QuarkXpress (and more recently Microsoft Publisher) files directly into Adobe InDesign with the least amount of additional effort has give me the ability to standardize my workflow and has allowed me to accept jobs that I would have otherwise had to refuse. I hope the folks at Markzware will continue to keep up the good work. Just a note to say a big Thank You for creating such a wonderful plug-in as Q2ID. As a longtime Quark user, I knew of no easy way to switch to InDesign without recreating all my existing documents. Your product instantly solved that problem. Q2ID works seamlessly and so far I've had no problems. "What a wonderful Adobe InDesign Plugin Q2ID is! It works perfectly! It saves me hours of repetitive work." Copyright © 2011 - 2018 DesignsEasy.com. All rights reserved. DesignsEasy.com is an affiliate member of Markzware.